I “read” this book as my first audiobook ever and it made me fall in love with listening to stories. But because of this, my “reading”experience was wholly different than when I would’ve read it from paper. Nevertheless, I LOVED Behind Closed Doors. It was the perfect domestic thriller that really made me think about the fact that you actually never really know another person. What may seem like the perfect couple, could actually be a horror story in disguise. I loved the buildup of the story – at the start I did of course know that something was wrong, but not exactly what. 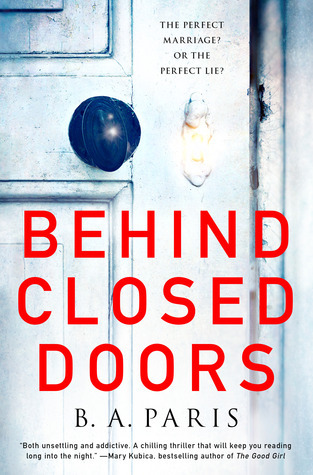 Slowly, very slowly, you get to know what secrets are hiding behind the front door of the seemingly happy home of Jack and Grace. This buildup made the story believable – normally I would think “such things just won’t happen to me. I’d see it coming from miles away”, but Grace’s story really made me doubt that. This could happen to anyone. However, there still was something in the character of Jack that made it a bit less believable. That’s why I gave it 4.75 stars instead of the full 5 stars!